This project consisted of installing a video projection system in a church that was more than 80 years old. Since no structure existed for the screen a fake wooden beam was built that would not only hold the electric screen but also blend in with the existing architecture. 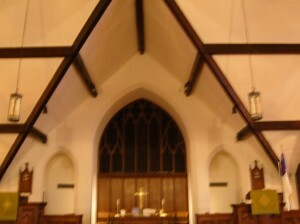 When the screen was raised it was not apparent that any audio visual equipment existed in the room. 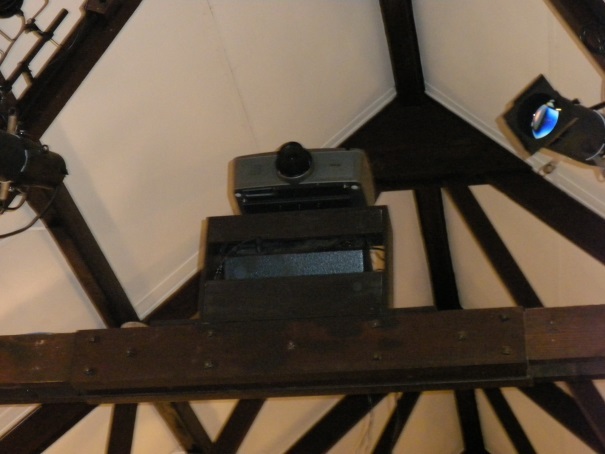 The projector used was an Eiki LC-XL100 5000 Lumen LCD projector which was mounted on an existing wooden beam. This particular projector was used since it had the flexibility in not only the throw distance but also the vertical lens shift. No additional expensive long throw lenses were required. Both an analog PC and digital HDMI connection were run from the projector back to the control station using twisted pair converters. 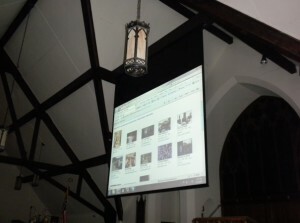 A simple wired controller was installed so that users could turn the projector On and OFF and select the source.